This week, researchers at the Gulf of Mexico Oil Spill and Ecosystem Science Conference in New Orleans, Louisiana, are assessing the outcome — and sometimes drawing markedly different conclusions from the scant data. 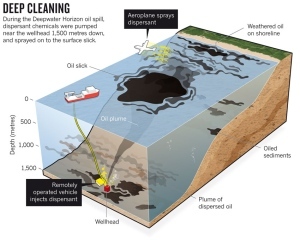 Industry scientists argue that the nearly three million litres of subsea dispersant worked as expected and caused minimal ecological damage. Dispersant, they say, should be a standard option for fighting future sea-floor blowouts. But other researchers say that applying dispersants at depth has not yet been proved to be effective, let alone safe. Both the US National Oceanographic and Atmospheric Administration and industry representatives have touted aerial photos showing that the surface oil plume in the Gulf of Mexico diminished after dispersant was applied. And oil company BP, which owns the well, reported improvements in the air quality measured from work ships, suggesting that less oil was floating to the surface. Seawater samples collected at depth during the spill for monitoring by the US Environmental Protection Agency also suggest that the dispersants worked, according to data presented by Kenneth Lee, a marine biologist at Fisheries and Oceans Canada in Dartmouth. He and his team documented droplet sizes that are consistent with lab experiments in which dispersant and oil are mixed in a wave tank. Researchers debate oil-spill remedy : Nature News & Comment.